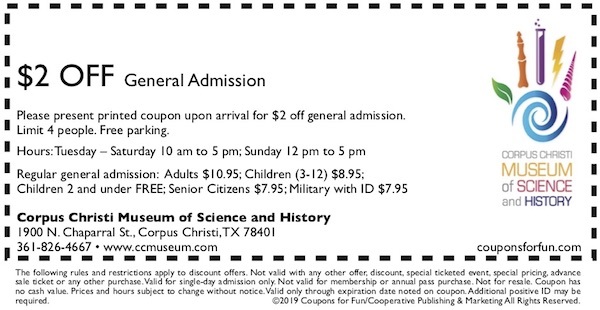 Corpus Christi Museum of Science and History - Texas - Get coupon! The Corpus Christi Museum of Science and History is perched on the scenic harbor water front in Corpus Christi, Texas, within the Sports, Entertainment and Arts (S.E.A.) district. The Museum, established in 1952, provides history, science exploration and educational programming, and serves over 100,000 visitors. Visitors will find hundreds of thousands of artifacts and historically significant items in it’s 90,000 SF facility. Exhibits and programming inspire curiosity, understanding and an enduring thirst for knowledge.